Inchin is a desert world with a thin tainted atmosphere. The system supports a population of fewer than 10,000 sophonts. It is a Human dominated Non-Aligned world in the District 268 Subsector of Spinward Marches Sector. Inchin is a desert world with a thin tainted atmosphere. The system supports a population of fewer than 10,000 sophonts. It is a client state of Regency of Deneb in the Plankwell Subsector of Spinward Marches Sector. District 268 contains many inhabited planets with unpleasant or downright inhospitable environments, but most of these either possess valuable resources (Dallia, Trexalon, Kuai Qing, etc.) or were settled more or less by accident (Singer). Inchin stands out as just about the only inhospitable planet in the subsector that was deliberately settled despite its lack of any meaningful natural resources. The reasons for its unattractiveness are many and daunting. It has minimal gravity, no water, an uncomfortably high surface temperature, and a very thin, tainted atmosphere. Its dreary, featureless plains of yellow (sulfur-rich) sand and rock do not even possess the kind of stark natural beauty that is the redeeming feature of many other desert worlds. The fact that Inchin is inhabited can be credited to Iarl Rowri, the youthful heir to a shipping fortune on Collace (Spinward Marches 1237). Like many others, Rowri was impressed by the ample profits that Avastan Portways, Inc. (API) reaped after constructing a C-class starport on Avastan (Spinward Marches 1037) in the early 1000s. Rowri decided to do API one better by using his huge inheritance to construct an A-class starport on neighboring Inchin. He reckoned that, as the only A-class starport in District 268 and on the entire length of the J-1 main running between the Glisten and Five Sisters subsectors, the new facility would soon come to dominate the lucrative starship repair business in the subsector. The business plan was a good one, insofar as it went, but from the very beginning its execution was terrible. Rowri’s first error was to choose Inchin as the site for his starport. This choice was made because Inchin had the shallowest gravity well of any body in the system that possessed an oxygen-nitrogen atmosphere - which merely had to be compressed and filtered to be made breathable (eliminating the need to build costly air generation plants). However, the complete absence of water on Inchin meant that there was no naturally-occurring source of hydrogen to be refined for fuel - much less water necessary to sustain the lives of future residents. Rowri intended to remedy this by importing ice asteroids from the system’s two asteroid belts, but this proved to be far more complex and expensive than anticipated. The real problem, however, was Rowri himself, who refused from the start to treat the project as a hard-headed business enterprise. Instead, he began pursuing a grandiose vision of self-aggrandizement by declaring himself “Baron of Inchin”, and ordering the construction of a luxurious palace and city on the planetary surface as the capital of his “fief”. From the moment the first construction crews arrived in 1086, their energies were divided between the starport and the capital city. Worse yet, at Rowri’s insistence, construction of the city tended to take precedence over progress on the starport, which was definitely putting the cart before the horse. The original plan had been to complete the starport first so that it could generate revenue that would allow completion of the rest of the project. In the end, any pretense of a coherent plan was abandoned, and construction proceeded in fits and starts as workers and money were constantly shifted back and forth between various priorities according to Rowri’s fickle whim. As delays stretched the planned three standard year project into its eleventh year, costs snowballed to the point where Rowri alone could no longer afford to finish it. With great reluctance he solicited outside financing, but Rowri’s reputation for mismanagement scared off investors and he refused to allow anyone else to oversee the execution of his grand vision. Strangled by insufficient funds, construction sputtered to a halt in 1097 and has barely progressed since. Rowri then became obsessed with the idea that the Inchin system contained rich mineral deposits whose discovery would solve all of his financial problems at a stroke. Therefore, beginning in early 1098, he launched a full-scale survey of the entire system. Research facilities are still in operation on no less ten planetary and lunar surfaces, but to date no major strikes have been made. Some 8,000 workers remain on what’s come to be known as “Rowri’s Folly”, most of them engaged in trying to prevent the half-finished city and starport from falling completely into ruin. Living and working conditions are so bleak and unpleasant that, in order to retain laborers, Rowri must offer unusually high wages - and oblige workers to sign contracts that bind them to remain on Inchin for three years. The small, but heavily-armed “Baronial Guard”, ever fearful of uprisings among the workers, upholds an oppressive law enforcement regime and clamps down on even the mildest signs of disaffection. Private ownership of any kind of weapons has been prohibited, including within the starport’s boundaries, but the workers have ready access to improvised knives, swords and spears. In better times, Rowri was a congenial, good-natured sort whose impulsive and sometimes eccentric behavior was found charming by most. Since his fortunes began to decline, however, Rowri’s behavior has become ever more erratic and capricious, bouncing unpredictably back and forth from one extreme to another. “Baron” Iarl I now rarely leaves the uncompleted shell of his palace, from whence he issues florid proclamations to his “subjects” that seem increasingly indicative of mental instability. Outbursts of uncharacteristic anger and vindictiveness can give way suddenly and without explanation to reflective moods of self-doubt and apology, and even to acts of compulsive generosity. On several occasions, Rowri has tried to dampen labor discontent by impulsively promising large, across-the-board bonuses that it later proved impossible for him to pay more than a small fraction of. Inchin has a poor quality starport. Inchin possesses a Technology Level of TL–10 or TL-A in Hexadecimal Notation. Inchin has a Feudal Technocracy government. Although the colonization of Inchin followed millennia-old precedents on occupying uninhabited planets in unclaimed territory, Rowri's title of as "Baron of Inchin" is recognized by no interstellar state. Indeed, several political entities -- including the Imperium and the government of Collace -- that initially accepted the legitimacy of Rowri's regime have now withdrawn recognition. 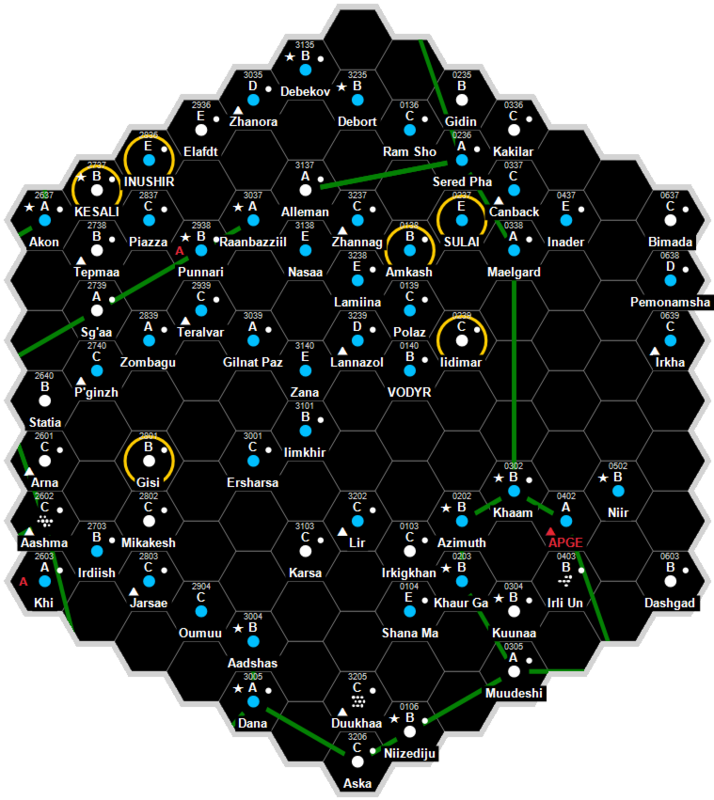 Many of Rowri's tirades focus on Avastan Portways, Inc., which operates the starport in the neighboring Avastan system. He accuses API of trying to prevent Inchin from becoming a competitor on the Collace Arm of the J-1 Spinward Main by sending covert agents to foment labor unrest. The Baronial Guard is constantly on the hunt for API agents (real or imagined) and has dealt harshly with several suspects. Martin Dougherty, Neil Frier. Behind the Claw (Steve Jackson Games, 1998), 73. This page was last modified on 7 January 2018, at 13:18.